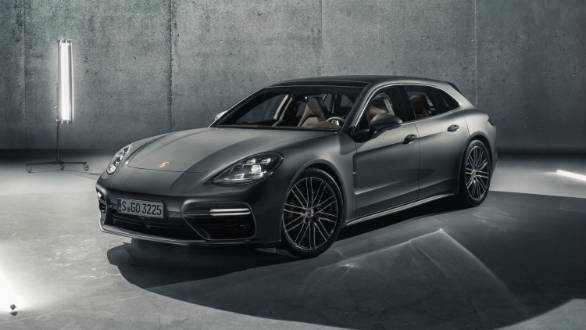 Close on the heels of the launch of the all-new Porsche Panamera sedan, the company has taken the wraps off its station wagon sibling, the 2018 Panamera Sport Turismo. Now we sampled the new Panamera sedan recently and the car managed to blow our socks off, for its sheer ability to ride and handle in a way no car of its proportions ever could or should. But that's Porsche's engineering ingenuity and prowess in one of the finest cars to have rolled out of Stuttgart. And thankfully, it looks far better than its predecessor too which, as Rishaad puts it, is like a four-door 911. In the same vein, the Sport Turismo looks quite stunning. The front end and the area up to the B-pillars are similar to the Panamera sedan, after which the station wagon form begins. The roofline hence continues to taper slightly before meeting the C-Pillar unlike the coupe-style roofline in the sedan. An off-shot of the station wagon design is more headroom for rear passengers. The curvy rear end of the car looks proportionate and features similar lamps as seen in the sedan. The Panamera Sport Turismo is 5,049mmm long, 1,428mm high and 1,937mm wide, while the wheelbase spans 2,950mm. As usual, the interiors look befitting of the Porsche badge and there'll be a long of personalisation options. The Panamera Sport Turismo is the first Panamera to feature 4+1 seating. 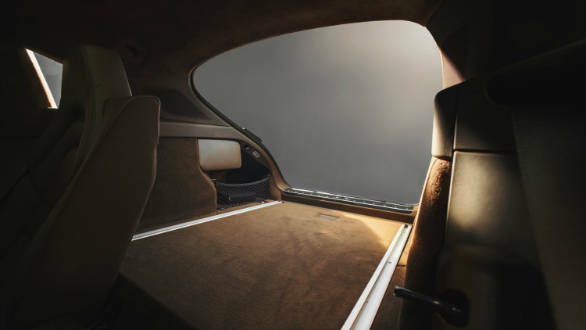 Which means the car can accommodate three passengers at the rear unlike the Panamera sedan. The wagon, as expected, has more cargo room with the total capacity rising from 520 litres with seats folded up to 1,390 litres when the rear seats are folded flat. The loading lip, at 628mm, is also lower than the sedan's which facilitates easier loading and unloading of luggage. The car also features an extendable rear spoiler that deploys at from the roof in three stages, depending on the speed of the car. The spoiler generates 50kg on the rear axle. At speeds of up to 170kmph, the spoiler is in the retracted at an angle of minus seven degrees, which helps reduce drag and improve fuel-economy. Above 170kmph, the spoiler moves to the second stage with the wing angled at plus one degrees for improved stability. In the Sport and Sport Plus mode, the spoiler deploys to the performance position at speeds in excess of 90kmph. Internationally, Porsche is offering the Panamera Sport Turismo wagon in four variants - base, E-hybrid, S and Turbo. Each of these variants features different powertrains; however, all variants come with all-wheel steering. For India, Porsche will get the Panamera Sport Turismo with the full-fat V8 motor. The base Panamera Sport features a turbocharged V6 motor that develops 330PS and propels the car from 0-100kmph in 5 seconds. The E-hybrid 2.9-litre twin-turbo V6 that along with the electric motor develops 462PS. It completes the 0-100kmph dash in a claimed 4.4 seconds. 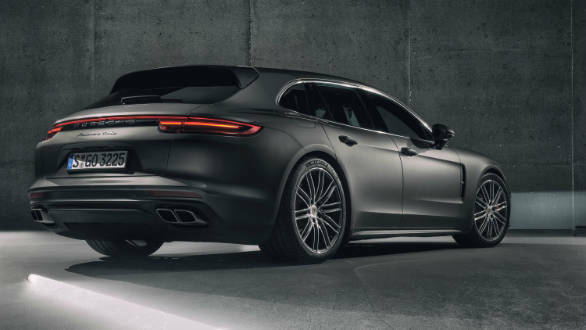 The Panamera Sport Turismo Wagon S also uses a 2.9-litre twin-turbo V6 which produces 440PS, enough to see the car cross the 100kmph mark from standstill in 4 seconds. The range-topping Turbo has a massive 4-litre twin-turbo V8 motor that develops a whopping 550PS, and it is the fastest Porsche Panamera wagon with a 0-100kmph time of 3.4 seconds. Those are near-sportscar figures from a car that is twice as bigger. 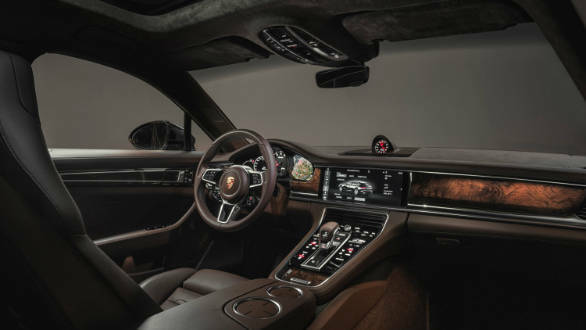 While we cannot comment on ride and handling without sampling the car, we suspect the wizards at Porsche must have injected a similar kind of capability as the Panamera sedan, which is brilliant already. Bookings for the new Panamera Sport Turismo have begun, and customers in India can book the car from any Porsche Centre in the country.